At Energy Saving Lighting, we like to shine our spotlight on one product each month that we believe is especially useful for home and business owners looking to save money on their energy bills. This month, the spotlight is falling on the Philips 17 Watt PAR 38 Replacement Lamp. This bulb is well suited to a variety of applications, offering the equivalent of 90 watt standard incandescent bulbs, but they’re ideal for replacing bulbs that are in hard-to-reach areas, on for an extended period of time or need to be environmentally friendly. If you’re replacing a bulb in a hard-to-reach area or planning to use this light for an extended period of time, this bulb is a great choice over an old-fashioned incandescent light bulb. The Philips line of PAR 38 bulbs are rated for a very long life. You can expect them to put out 70 percent as much light after 25,000 hours of operations as they did when brand new. This means you won’t have to change your light bulbs nearly as often. In fact, you can expect to change an incandescent bulb 25 times before you’d have to change this bulb at all. 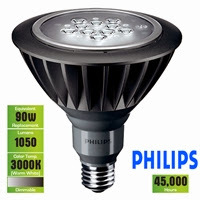 The savings customers see with this bulb are phenomenal as well. You can expect to see $31.97 in annual savings and a 272 percent lifetime return on investment. That’s $159.85 over five years. For businesses and homeowners looking to save a little money, making the switch over to energy efficient lighting is a no-brainer. This PAR 38 lamp is suitable for use in wet locations and open devices, but should not be used with dimmers or in enclosed fixtures. If you need a dimmable lamp, check out the rest of our selection of LED outdoor lamps. Looking to make the outside of your home more beautiful, safer and more secure? There’s no better way to accomplish these goals at a price that fits your budget than to install decorative and security outdoor lighting around your house. Outdoor security lighting deters crime, makes it easier to walk through your yard at night and helps emergency vehicles locate your house at night. Decorative lighting can give your home a warmer beauty and make it easier for you to host outdoor parties at night. Determine which areas of your landscape need security lighting. Walk through your yard and look for dark spots in places where there might be hazards, such as uneven ground or water hoses. These are the places where you’ll want the bigger bulbs, such as a LED PAR 38 bulb, to provide a bright light for the area. Find the places where you might want decorative outdoor lighting. Decorative lighting goes around your house to create warmer tones and shadows around your home, building the curb appeal of your house. Look for bulbs that are suited for outdoor use and offer a long lifespan. LED outdoor lights are great options when installing landscape lighting because they have longer lifespans and use less energy than traditional bulbs, meaning lower bills and less frequent bulb changes. Regardless of the type of bulb you purchase, make sure it’s been rated for outdoor use and will work with the fixture you’re interested in using. Once you’ve determined where you want outdoor lighting and which bulbs you’d like to use, check with your city or county to learn of applicable codes for installing outdoor lighting and get started. Installing new lighting can be a fun weekend project that increases the value of your home. Have questions about outdoor lighting? Leave us a comment and we’d be happy to help!